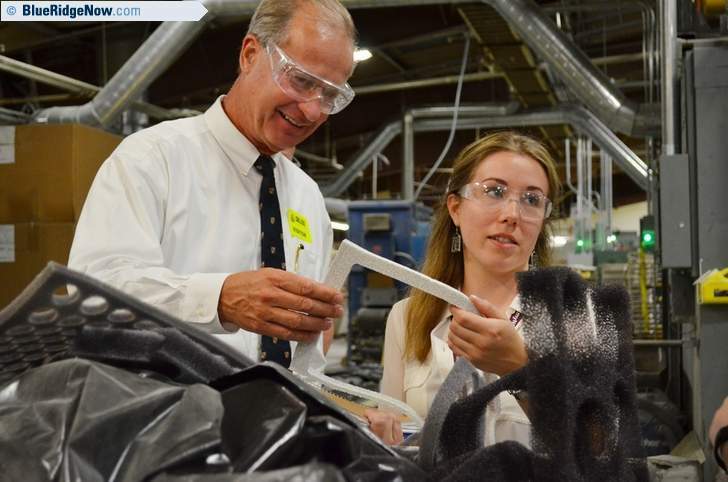 Alesia Griesmyer, of Selee Corp., speaks with N.C. Department of Environmental Quality Secretary Donald van der Vaart Thursday during a tour of the company's Hendersonville facility, showcasing its waste-reducing and other environmental efforts. Published: Thursday, July 7, 2016 at 9:20 p.m. Last Modified: Thursday, July 7, 2016 at 9:20 p.m. The loads of waste headed to the landfill from Selee Corp.'s headquarters on Shepherd Street in Hendersonville have been getting smaller and smaller, and eventually, the company hopes, those trips will stop altogether. Selee, which manufactures ceramic filters for molten metals, is working with the N.C. Department of Environmental Quality to help further reduce its already shrinking waste streams. Thursday, DEQ Secretary Donald van der Vaart, and Deputy Secretary John Evans and Assistant Secretary Tom Reeder, toured the plant to get a look at just how that's happening and how Selee is utilizing DEQ programs to meet its waste reduction goals and become more profitable. Alesia Griesmyer, environmental compliance officer for Selee, is the tip of the spear for the company when it comes to reducing waste. Griesmyer led the group on the tour around the company's bustling warehouse, showing the company's processes and different types of waste. The company also has a Green Team that meets once a month, she said, and right now is working on the partnership application to the DEQ's Environmental Stewardship Initiative, a program designed to promote superior environmental performance, providing technical assistance and networking opportunities to work toward reducing pollution and environmental impacts. Selee started working with the DEQ programs earlier this year, doing a Lean and Green workshop on how to reduce waste and save on labor, costs and materials, Griesmyer said. Ten Selee staff participated in the four-hour Lean and Green workshop that provided training and exercises on leaning techniques, clean processing and an in-depth evaluation of one of Selee's manufacturing lines. From that, 15 opportunities for improvement were generated with an estimated $122,000 of operation cost savings, according to information provided by DEQ. Selee worked with DEQ and the Waste Reduction Partners, a 50-volunteer team of scientists, engineers and industrial professionals, to complete a comprehensive solid waste reduction assessment that generated a 15-page report covering cost-effective options for handling and recycling waste generated on-site. The report addressed 544 tons of materials that could have alternate markets besides the landfill, according to DEQ. “Our biggest success this year, is we found an outlet for one of our largest waste streams; it's 26 percent of what was going to landfill is now going to compost,” Griesmyer said. That move alone is set to save the company around $20,000 a year, and diverts 450 tons of leftover ceramic slurry, mainly mineral powder, to a composter. Currently the company is struggling with finding an alternate outlet for its scrap ceramic filters, she added, saying it's difficult to find someone who wants to take them, though the company can reclaim some of the material itself. The ESI is also helping the company look at how those can be used to help rebuild coral reefs off the North Carolina coast, working with the North Carolina Marine Fisheries as well, which is currently analyzing how well the ceramic filters would serve as manmade reefs. Selee now also composts its cafeteria and bathroom waste, and “a big part of it is just getting that employee culture to kind of change,” Griesmyer said. It's something she said she's already started to see, with employees now approaching her with ideas and suggestions. Mark Morse, company president, said the long-term goal of the company is to eventually send zero waste to the landfill. “I think it's one of our responsibilities as members of this community and society,” as well as the company's employees, neighbors and shareholders, “to remain economically viable,” Morse said about the zero-waste effort. The effort to nix all waste from landfills will take a long time, and may not even be possible, he said, but it's the overriding goal. Van der Vaart said his particular interest is in seeing companies that make strides environmentally, in a way that helps their bottom lines as well.